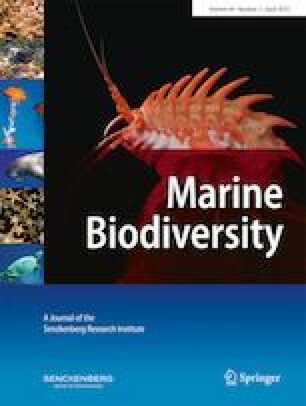 Diversity of marine nematodes in coral degradation zones (CDZs) has been poorly studied despite of its contribution to global coral reef diversity; additionally, effects of spatial scales on nematode assemblages are also largely unknown. To fill this gap, we studied the marine nematode assemblages in CDZs from two coral reefs in the Caribbean Sea to describe the diversity, test the effects of spatial scales, and explore if there were adaptive biological trait combinations. We sampled 2 reefs (Ballenatos and Punta Francés), 6 sites, and 20 dead coral piles in a fully nested design identifying the nematodes to species level. CDZs harbored a diverse nematode assemblage of 112 species with large spatial turnover. Differences between reefs in abundance and species density were probably related to differential energy availability, with Punta Francés receiving larger input of material and energy from land. The spatial scale had a significant effect on the species richness, whereas differences in species composition were mainly driven by the scale at which ecological drivers operated (10−1 m for interstitial heterogeneity vs. 105 m for dispersal). Geographical distances in the order of 180 km likely constituted barriers to nematode dispersal and as such promoted assemblage dissimilarity. Our evidence indicated that a particular set of biological traits favored the adaptation of nematodes to CDZs, namely a distinctive combination of armed stoma, ornamented cuticle, and conical tail. The online version of this article ( https://doi.org/10.1007/s12526-019-00945-z) contains supplementary material, which is available to authorized users. We appreciate the comments by two anonymous referees that improved the manuscript. We thank Idea Wild fund for providing equipment used during this research. This study was partially funded by The Ocean Foundation though the Proyecto 3 Golfos Initiative and by Dalio Family Foundation through a grant to A Apprill and A Santoro. Data generated or analyzed during this study are included in this published article and its supplementary information files.